The Nokia 5800 XpressMusic has been updated to version 31.0.101. V31.0.101 is apparently a minor firmware and does not bring noticeable new features such as kinetic scrolling. Rather it brings bug fixes and system stability. The update is currently available for a few product codes and can be expected to be available for further product codes in due course. 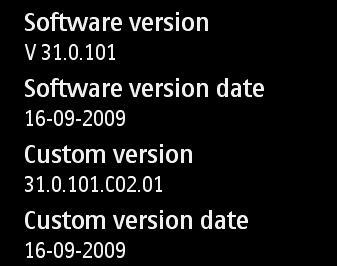 Yet the Firmware isn’t available through FOTA so you have to download the 133MB big update using the Nokia Software Updater. In case you don’t know how to update your 5800 XpressMusic you can read our ”How To: Update your Firmware”. The system stability is the most important update and the second is the 3g and Edge connection.